Join Filix Wood on a journey into an undiscovered and mysterious world, where being strong seems to be the only thing that counts and where the evil from the underworld constitutes a constant threat. Filix Wood understands that he must escape, but at the same time he has a strange feeling that he has finally found home. Survival of the Weakest is the first book about Filix Wood and his adventures. 389 years ago, a gold mine caved in. An expedition sacrificed themselves in order to protect the world from the evil that lurked beneath. The secret has been preserved for almost four hundred years when a young boy named Filix Wood wakes up in his bed with a strange feeling. It is like an invisible, thin thread of longing starts to grow from inside his belly button. It leads Filix away from the city, into the forest and beyond the world as we know it. He ends up in an isolated and hidden world where the inhabitants of the village live in the trees. They devote their lives to protect the rest of the world from the evil in the underworld, which, like lava, now threatens to destroy earth. It is also a world full of lies, a world where the young dream of something else instead of sacrificing themselves for the greater good. The search for finding your true self is at the center of the story. The relentless attraction that afflicts Filix Wood brings him back to his own unknown origin. He becomes the returner who meets the same kind of strong longing from the young in the village, but while Filix feels that he has found his home, they desire to get away from the trees where they have grown up. The isolated world around the mine is a society built entirely in harmony with nature. 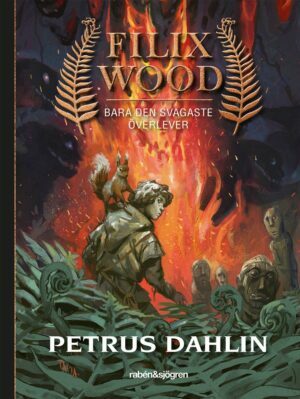 “Writing the fantasy novel about Filix Wood has been a way to deal with my own climate anxiety”, says Petrus Dahlin.